Summary of today’s show: This week, the US bishops issued a new and passionate statement on the current debate over religious liberty precipitated by the Obama administrations rules mandating coverage for contraceptive care in health insurance. Scot Landry, Fr. Mark O’Connell, and Domenico Bettinelli consider the statement in a similarly passionate discussion, including the clarifications from the bishops on the 7 things that the debate is NOT about (despite media coverage to the contrary), the 3 things that the debate is ACTUALLY about, and 5 next steps the bishops have pledged to take. 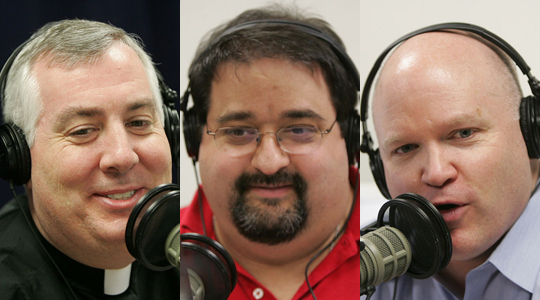 Today’s guest(s): Domenico Bettinelli, Jr.
1st segment: Scot and Fr. Mark caught up on the last week. He was on vacation last week, but came back to crises in both the office and family. He’s looking forward to St. Patrick’s Day weekend. Most of Fr. Mark’s background is Irish. Scot read an article about St. Patrick from this week’s Pilot, giving the background on the Irish saint who is the patron saint of Boston. Scot said that to us in the Archdiocese of Boston and throughout the Church in the US, we look to St. Patrick especially, considering what Irish Catholics have done for the Church here over the decades. Scot said St. Patrick did not march in parades or drink green beer, but the Church does not discourage celebration. We just ask that in the midst of celebrating to say a prayer to St. Patrick for the Catholic Church. Fr. Mark said he has heard today from some people upset the Cardinal did not give a dispensation from Lenten abstinence for meat today, the day before St. Patrick’s Day. 2nd segment: Scot said he still hears from people wondering what the big battle is about between the US bishops and the Obama administration, so we will go through the document in detail. An unwarranted government definition of religion. The mandate includes an extremely narrow definition of what HHS deems a “religious employer” deserving exemption—employers who, among other things, must hire and serve primarily those of ￼￼￼￼￼￼￼￼their own faith. We are deeply concerned about this new definition of who we are as people of faith and what constitutes our ministry. The introduction of this unprecedented defining of faith communities and their ministries has precipitated this struggle for religious freedom. Government has no place defining religion and religious ministry. HHS thus creates and enforces a new distinction—alien both to our Catholic tradition and to federal law—between our houses of worship and our great ministries of service to our neighbors, namely, the poor, the homeless, the sick, the students in our schools and universities, and others in need, of any faith community or none. Cf. Deus Caritas Est, Nos. 20-33. We are commanded both to love and to serve the Lord; laws that protect our freedom to comply with one of these commands but not the other are nothing to celebrate. Indeed, they must be rejected, for they create a “second class” of citizenship within our religious community. And if this definition is allowed to stand, it will spread throughout federal law, weakening its healthy tradition of generous respect for religious freedom and diversity. All—not just some—of our religious institutions share equally in the very same God-given, legally-recognized right not “to be forced to act in a manner contrary to [their] own beliefs.” Dignitatis Humanae, No. 2. In some parishes, where the RCIA candidates are present, sometimes they will use a different Gospel that goes along with the questions or Scrutinies put before the candidates. But most people will hear this Gospel. This is perhaps the most famous verse, John 3:16, and it is the perfect summation of the Gospels. Scot said that “believe” doesn’t just mean acknowledge his existence, but means those who “live the truth.” We have to be seen that we are living in God, not joust for God. Fr. Mark made it very clear that one doesn’t have to explicitly state belief in Christ to go to heaven.